There was a nice little feature about my blog the other day on The Vintage Moth, a fantastic site for free vintage images, (thank you Abbie!) 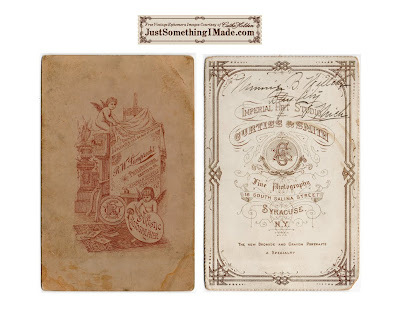 At the bottom of the post was an image of the back of an antique cabinet card (look around, she has more!) …and so my wheels began turning. That same day I was in an antique shop and one of my favorite dealers had a box of such photos. 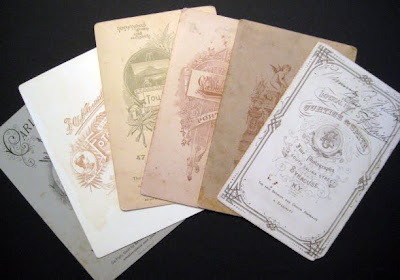 I picked up the box, turned it completely around backwards and began to thumb through the cards not by the photographs, but by looking at the fantastic 1800s graphic designs on the back. I bought 6 cards, scanned them into digital images and came up with an easy and inexpensive project for using their graphics. 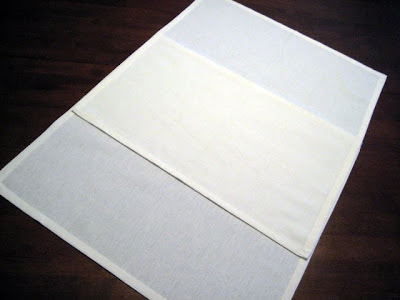 I found two square muslin dinner napkins at Kohls on sale for $.97 each. I laid out one, then the other on top scooted up some. 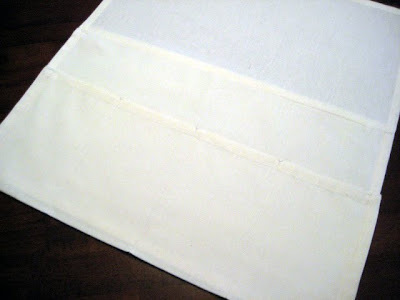 It’s important to note that these pre-hemmed napkins don’t always line up evenly. I recommend you lay them out at the store to find a pair that mach up best before buying. 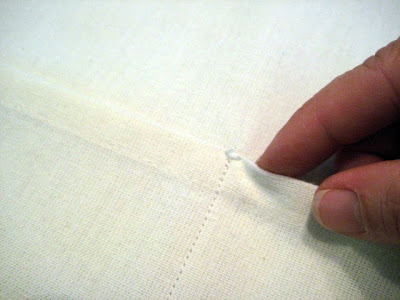 I then folded the bottom piece up and over the top to create a section for sewing into pockets. I reinforced the top stitched areas of the pockets with a zig-zag stitch in place. I flopped 4 of the card images and printed onto T-shirt transfer sheets as per the instructions. Cut out each card image and pressed one onto each pocket section. I peeled off the backing paper and hung the entire piece over the arm of my couch. For most all graphic design projects, I start in my living room with resource books, pens, and sticky-notes, from my my favorite chair in the corner, where I have access to my library as I sketch ideas. I now have an organizer that hangs over the arm of the couch within reach to hold my research supplies, reading glasses and more. Enjoy these beautiful free images for your own crafts! 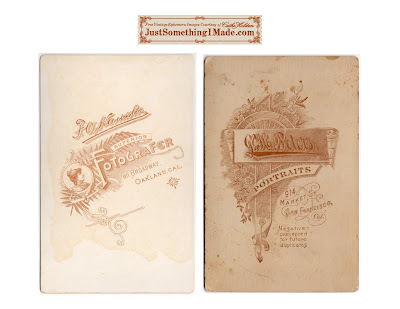 This entry was posted in Uncategorized and tagged cabinet cards, diy project, Free digital downloads, free vintage clip-art, linen napkins, organizing, purse organizer, t-shirt transfers. Bookmark the permalink. I absolutely Love the vintage images! Thank you so much for sharing them! I will let you know how I use them! LOVE this idea! 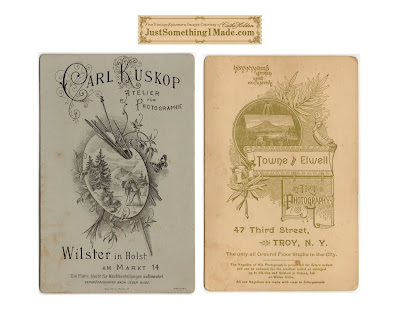 I have a big collection of cabinet cards and love the backs too. Now I have something to do with them!! You have such good ideas…and good directions, too. My big living room chair is where i do all my work-what a great idea! Now, my crochet hooks, pens, and jewelry pliers will have a home (come January, when I have time to make something i'm not trying to sell)! I just need to find my presser-foot which was misplaced in our move. I can't think of anything worse than losing that. Thanks for the wonderful tutorial. These are beautiful! I have never heard the term "cabinet cards" though…wondering where that comes from. I have lots of old photos, now I want to go look on the backs of them! Thanks once again for sharing! Cathe, do you dream creating? You always have such wonderful ideas! Thank you for the lovely graphics. I am always so pleased to see what you are up to. Thank you for your generous spirit of sharing with us…. p.s. check out the Santa that I posted this evening. He is so darling. I love it – thank you for sharing not only the pictures, but the ideas with us! What a clever cookie you are. This is a wonderful idea and a great tutorial. Great idea and I love the images too!! This is a lovely idea and I love the vintage images too. These are ever so beautiful..and thank you for sharing the tutorial..although I doubt I could ever get even half way through! Cathe, I love this idea, I am such a big fan of the Vintage Moth as well. Those are such wonderful vintage images you shared with us again, Cathe. Many thanks! Cathe, that is the greatest project ever! I'm going to try to make one for my grandma's favorite chair! I am using one of your free blog gadgets ("don't stop here; click on older posts") on my soon to be released website, kitty:magazine! I just love your work…thanks! Oh, I love this organizer…I could use these all around the house..hehe..all kidding aside….it turned out just wonderful..thanks so much the tutorial on how you made it and for offering the images to us. Wow! I just discovered your blog and can't believe what I have been missing. Your creativity and imagination astound me – you have been blessed with an amazing gift! I don't want to miss a thing so I just signed up as a follower. What a nifty idea. I really loved how you gave such clear instructions with the photos. What an awesome idea and thank you very much for the images! These are gorgeous and I never knew to look at the backs of old photo cards! Really great idea for an organizer! You are so awesome and generous, and my also thank you for adding your name and logo with your shared graphics. I always try to give credit to the source when using shared works, but honestly forget where I find many of them, I've tried adding in the saved subject line, do you know how long that can get!! I'm so appreciative of you adding your tag in those images!! Thank you for all you share!! That is Awesome!!!! 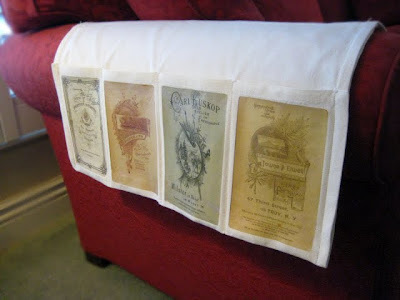 I wish I knew how to sew because we are so in need of one of these over the arm of the couch holders! Beautiful and elegant – and possibly the coolest use of a linen napkin ever. 🙂 Thank you ! I don't know HOW you come up with the amazing things! I am curious as to the title of the design books next to said chair? A wonderful and very creative use of a vintage graphic. Thanks for sharing. Wonderful idea and so generous to share! Thanks! Hi Jen, Those are a few of my logo resource books. The top two are Taschen Logo Design books volumes 1 and 2. The rest are all the LogoLounge books, volumes 1-5.
such a cute and easy project! I have some images of my own I'm going to try with this, though I'm going to have to tweak it a bit so it doesn't slide off the leather arms of my chair. wish me luck! Love the idea and creative use of the vintage postcards! I'm also a graphic designer. My sewing machine is in the garage. I think I have to get it out! 🙂 Thanks for posting the scans of the postcards too. What a wonderful idea! I love the cards you picked up. The images are so pretty. Thank you soooo much for the link to The Moth. It is greatly appreciated. Your ideas are always so fabulous! Thank you for sharing the gorgeous images images. Very cool idea. I wish I had more time in a day to experiment with these types of shared ideas. What a great idea, and how sweet of you to share your images. Thank you! great idea! you could hang it on the wall too! Thanks so much for the images. I think I might actually try and make this one. That is a very neat idea! I kinda giggled thinking, "she's got the remote!" I thought only the husband got the remote! I just stumbled upon your wonderful blog and I'm so inspired! The organizer project is brilliant. 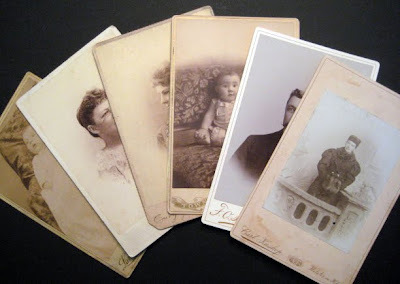 Thank you for sharing the cabinet card images, I can't wait to use them. you just never cease to amaze me. Thanks for always sharing the most clever ideas & graphics. I love your style! You just gave me an awesome idea for Christmas for the MIL! She collects Mexican folk art and does all of her jobs on the couch! How cool would it be to make one of these using images from the Dia De Los Muertos Bingo Card game???? PERFECTO!!!! Such a clever idea….and soooo cute too! Thanks so much for sharing the images. They're fabulous. That is such a great idea!! And it turned out so beautiful! !Thank you sooo much for sharing it with us! Oh dear Cathe, you KILL me with your creativity! Who would have EVER thought of this? I collect cabinet cards, now look what I can do! Thank you as always for sharing your creativity! Brilliant idea and lovely look! 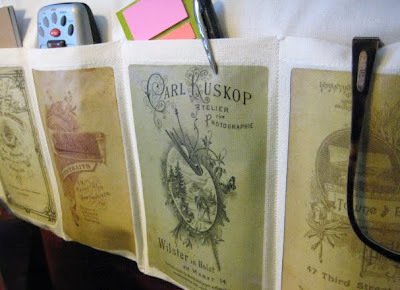 What a wonderful and creative use for those old cabinet cards ~ everything was so artfully done back in those days! I'm looking forward to visiting the Vintage Moth. Thanks for the tip, and thanks for sharing all your amazing images! Just wanted to say how much I enjoy your blog and look forward to your posts. And thanks for you generosity in sharing your ideas and the awesome graphics! This is a great project, and it came out so beautifully! Thanks for posting. 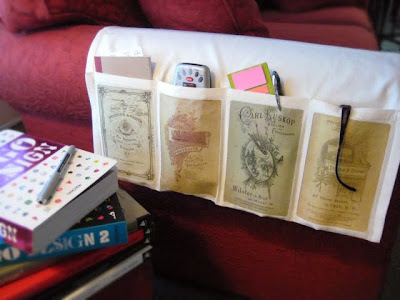 I have been looking everywhere for good instructions for an organizer project for my bedside. Thank you so much for sharing. Well darlin, isn't that just the best idea ever ? I've always wanted to try the T-shirt transfer and now I'm inspired ! Want to make pillows with me for Christmas ? See you Friday ! Bizzzzes de l'Abeille du Jardinoux ! Thank you very much for these nice images. I love old (embroidered)post cards and photos. It is such a good idea to use the back. How lovely ! Thanks a lot for this great idea ! Thank you for these nice images! Very. very nice images. And a great idea too! Thank you so much for sharing! Thank you so much. Such a clever project. And beautiful to boot. Such a wonderful idea. Love it! Just found you via Tip Nut. What a great project! Thanks for sharing the vintage images as well! Fantastic thanks for showing us how to do it. What an awesome idea, Cathe! 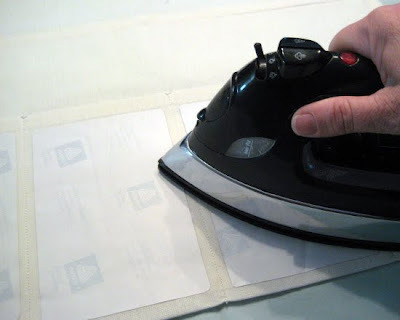 As soon as I get a sewing machine, this is the first thing I am trying!! Thank you! This is a great idea and thanks for sharing the links and the images. P.S. I never thought about using the backs. Thanks for sharing your wonderful creativity with all. I know that this is an old project but I had it in the back of my head for some time. Finally I got around to making one for my mother to hold her glasses, kindle and remote…She absolutely LOVED it! I then had to make one for my teenage son with a warhammer theme so he could put his book by his bed. They must be addictive because I swear the whole family wants one now! This is so beautiful. I love your creative pocket pictures. Brings the whole project to life. Your creativity amazes me! What a gorgeous and functional piece of art you have created. I absolutely love the vintage feel and only you could come up with these ideas! The day I found your blog was truly one of the most luckiest I tell you, I couldn’t stop thinking about it all day and on the way home from work etc. Thanks for sharing and God Bless. Wow! I just found your website on Pinterest. I love to sew and make quilted projects and I can’t wait to incorporate some of these into my projects. Thank you so much for sharing, people like you make the world a more beautifule place. 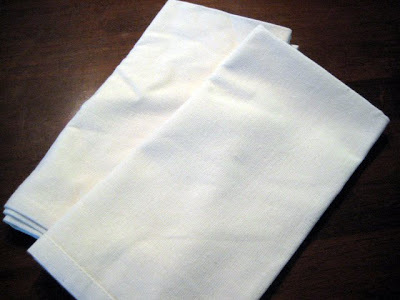 What size are your napkins? where am I able to get these images so I can print them for my kitchen ornaments?? Thanks so much Cathe for the great free printables you offer. Love them all!